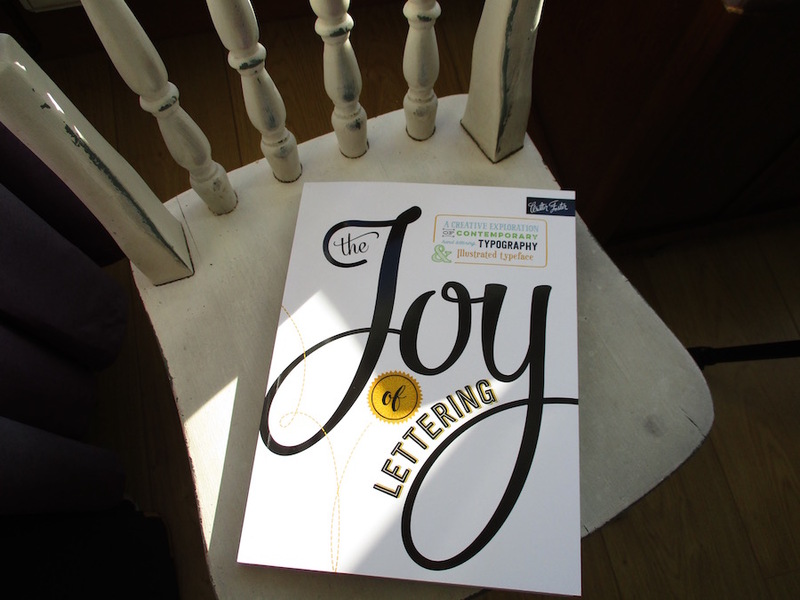 The Joy of Lettering – A book on a Chair…. Finally a perk for being an online calligrapher! I have been sent a book to review direct from the publisher. I am chuffed to be asked. 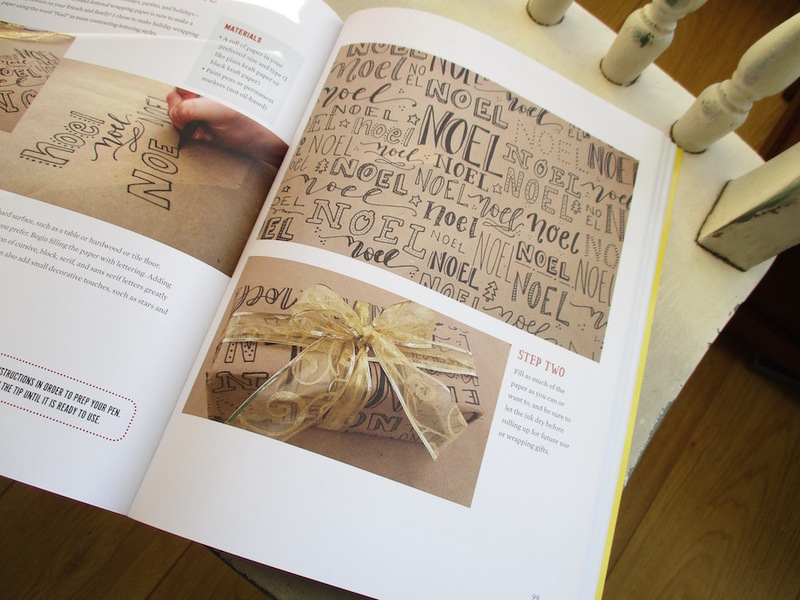 The book is The Joy of Lettering by Gabri Joy Kirkendall and Jaclyn Anne Escalera, and ‘joy’ is the operative word. A big book on a chair!! 144 pages of lettering joy!! …and I will possibly do something artful with an envelope. I was a little perturbed/distressed by pages 82-85…. I would be fibbing if I said I didn’t twitch a little – you will have to grab a copy of the book to find out why, fortunately the project featuring laminated foil made up for this – as I’ve always wanted to know how this is done, AND there is instruction on how to make a hand-lettered typeface, which is something I’ve always wanted to try. 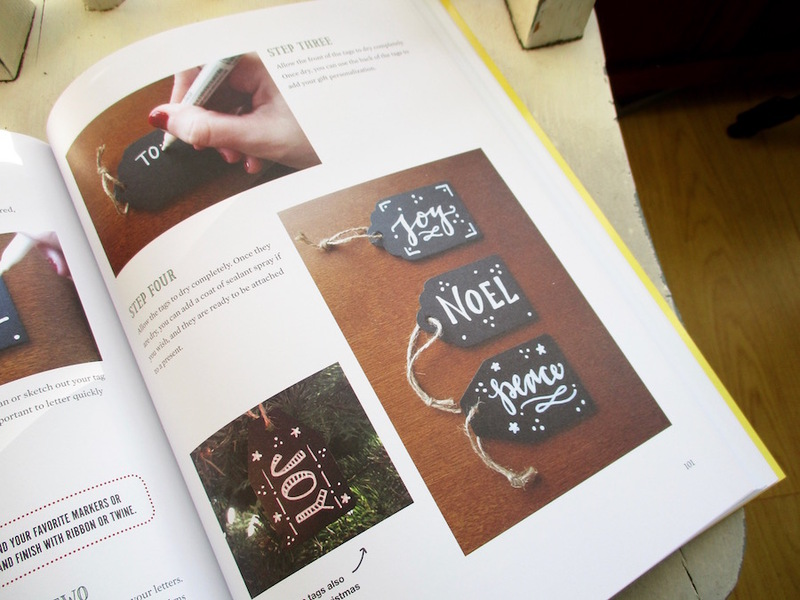 With hints and tips aplenty, The Joy of Lettering demonstrates how all lettering techniques can be applied to enhance a plethora of craft projects. It’s a resource book that encourages the reader to try new ideas, to hone their skills, and, most importantly, to develop their own unique style. Over Halloween I had a visitation. This often happens to me in October. A penny dropped. A discarded teabag was discovered in the hallway. A death occurred… and I finally committed myself to finishing my epic pamphlet called The Chronicles of Mogwash. Fear not, I will not randomly publish Mogwash related posts on this blog. I will finish the damn thing first so as not to cause my six dedicated Mogwash fans unnecessary suffering. May the teabag be with you. This entry was posted in Hand lettering, lettering and tagged a book on a chair, book review, hand lettering on November 7, 2016 by Scarlet. Oh! Oh! I am so looking forward to the Scarlet Letter Font® and the Mogwashian Chronicles, too! 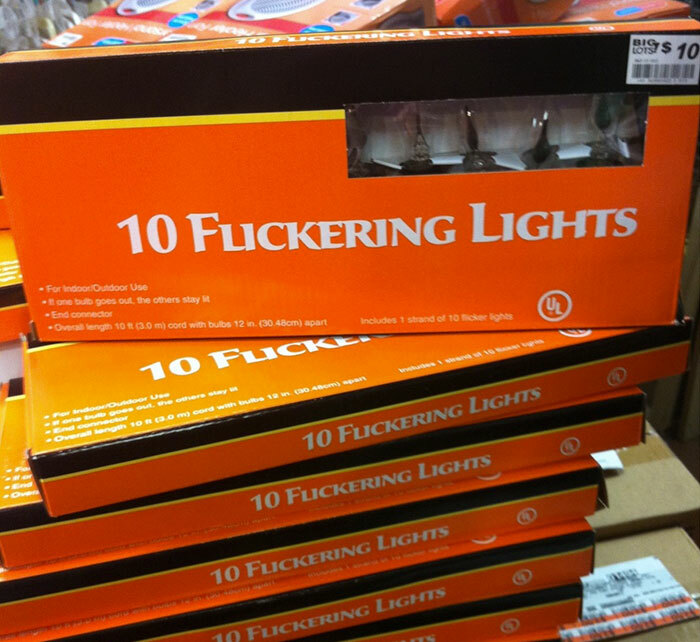 Just be mindful of the kerning! Ha Ha!!! Yes, that happens a lot with the new fangled modern calligraphy. Photoshop I can handle, generally, but my handwriting is appalling. If I created some gift tags and wrote Joy on them, they’d look like a 2 year old had produced them. Even before the days of artwork produced digitally I relied totally on Letraset. I have used Letraset, Joey!! Back in the good old days…. I’d probably use it in preference to photoshop. Maybe in a couple of weeks I’ll concentrate on this digitising malarkey and post about my experience. There will probably be swearing. I don’t even know what digitising means…well, yes, I know it’s to do with computerydoodling, but beyond that, I’m flummoxed. The book does look interesting.And it’s on a lovely old chair! I will be a disaster with the digitising, even with clear instruction, Dinah, my mind just switches off….I had the same thing happen at school with maths and netball. But I will really try to put my mind to it in the near future. Ha Ha!! I have plenty of follies, Mr Mags!! Mogwash…. 10 years in the making. 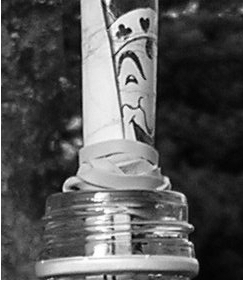 Only seems like yesterday that I cut my first bottle. I am on the edge of my seat – partly because there’s a ruddy big book covering most of it! – with anticipation of what pages 82-85 can hold. And laminated foil?! Will you be sweeping the rest of us aside in the next Tin Foil Hat Compo? Plus, I can barely wait to be confused and totally on the wrong track in Mogwash, and I expect there will be a post soon that will explain the visitation, penny, teabag and death? Or are these Mogwash things? See how rubbish I am already! A lot has happened in Mogwash. In my absence there has been a bizarre and disturbing occurrence. It will have to be handled with sensitivity. I am mulling it over. When is the next foil hat competition, Mr Devine? And do you think we should have a festive special in the same manner as Strictly Come Dancing? ::GASP:: Foil = Gilt? Do pages 82-85 cover gilding?!? Ooh, a Winter Wonderland Tin Foil Hat compo? Can it be done? This is something I shall have to mull over. We’ll soon have enough mull for wine! We do seem to be doing mulling aplenty in this comment thread. Then again this week has brought us a lot to mull. Oh…. A chair with a view! It has to be done! I wonder, do pages 82-85 cover Illegible Bouncy Modern Thin Spaghetti “Calligraphy”? It has been known to cause apoplexy, at least in me, and I think I’ve had seizures trying to decipher it. Ha, Ha!!! No, Amy, pages 82-85 cover a technique close to my heart. Congrats on being asked to review a book on a subject matter that you are so talented & skilled in. And thank you for the review! I know a few crafty/hobby people who would love a book such as this. Saves me the trouble of making then pralines as a holiday gift–leaving more pralines for me! There is something to be said for grinding nuts and boiling them….. okay, so maybe the book might be a better idea. Fancy being a book reviewer… see where all this book on a chair malarky has gotten you… Bravo! Don’t you think MsScarlet in a Marabou-costume would be a “show-stopper” ? Unfortunately I don’t think anything is going to stop this particular show. Oops! I got befuddled by my snazzy WordPress interface and thought I was commenting on your latest post. ONE OF THOSE DAYS. Apologies, Ms Princess, I got in a muddle with Mr Mags waving a marabou…. Thank you, it’s about time I got a perk. You should be very proud (hyped/satisfied/pumped/??) that a publisher would send you a book to review. Just curious, did they give you a deadline for the review? Hey, I just read tonight while trying not to think about this damn close election that the Brits are very upset (I need a good slang word) over the “Toblerone triangle change”. Did you have any stories on this chocolate crisis? Bill – Honestly, they might as well do away with the triangles now and just make bars of chocolate – either that or rename their new product ‘Mind the Gap’. I think I might have mentioned Toblerone in a story, I will have to check. mind the gap – good one for them to use in their next ad. Just the ONE teabag, Ms Mistress!!! Always carry a teabag for emergencies. Also, carry whisky. And a blanket. AND always have a solicitor on speed dial. I don’t think I’m qualified to comment on The Joy of Lettering, not being in the trade as it were. Personally, I’m about to complete the revelatory “The Joy of Chair and Settee Testing: All You Need to Know”. But I look forward to the Chronicles of Mogwash. No relation to Captain Pugwash, I assume. No, no Master Bates here, Nick. I am well versed in the joy of sofa testing if you need guidance. Lulu – the latest is that Nigel Farage has become the first British politician to meet the President-elect. I think we should stay in hiding for a little longer. Nige the Newt is obviously getting a pat on the back for his support. Pass the bucket. I am disappointed that Boris Johnson is not meeting with Trump and comparing hair styling techniques. Ha!! Back in the day when this was all a joke, I remember Have I Got News For You pairing their images and saying something along similar lines! Why is Donald so orange? What is that all about? “Why is Donald so orange?” That question may break the Internet. It’s likely he uses a self-tanner in the wrong shade. And the white skin around his eyes seems like goggle marks which indicates use of a tanning bed. Isn’t orange the new black? I have just seen a picture of Marine Le Pen on the BBC website. She is orange too!! Many times I’ve listened to Marine Le Pen spew her party line and I can imagine she and Trump in bed together. Oh now I wish I hadn’t said that as the image will be stuck in my head all day. I am now a jibber ing wreck. I remember finding your blog a long time ago and a new computer and messed up internet I lost you. Remembering your beautiful lettering ! Envious ! So now I have found you gain I don’t know how to follow. I will work it out.